I had no intention of purchasing any of the Fenty Beauty products created by singer Rhianna. However, when I saw her collection at my local Sephora, I was blown away. There were at least 5 people swatching the collection when I eyed the display, so I joined in and tested some of the products. The colors in this make-up collection are absolutely beautiful. In case you haven’t heard, the internet went crazy when this Rhianna make-up launched in September 2017. Specifically, she received much credit for launching a line of foundation in 42 shades. While that still doesn’t cover every possible skin tone, the Fenty Beauty collection might be the first to create such a spectrum. 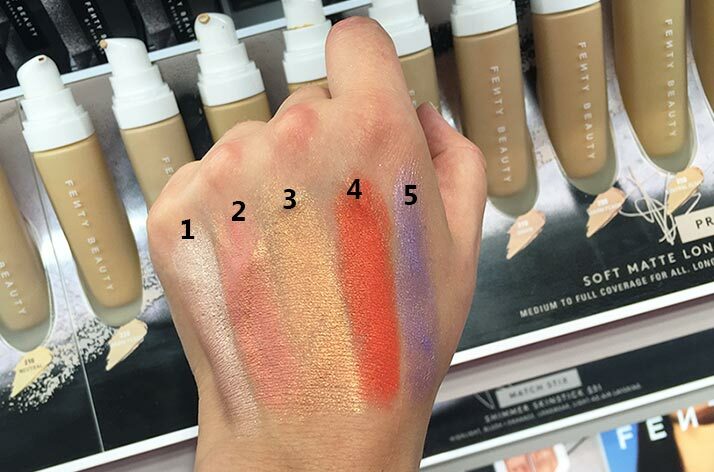 I swatched much of the Fenty Beauty collection at Sephora, and the quality appears good. I gravitated toward the Match Stix and found this unicorn-like color called Confetti. The Match Stix can be applied to cheeks for highlighting or as blush. Please note there are two types of Match Stix. 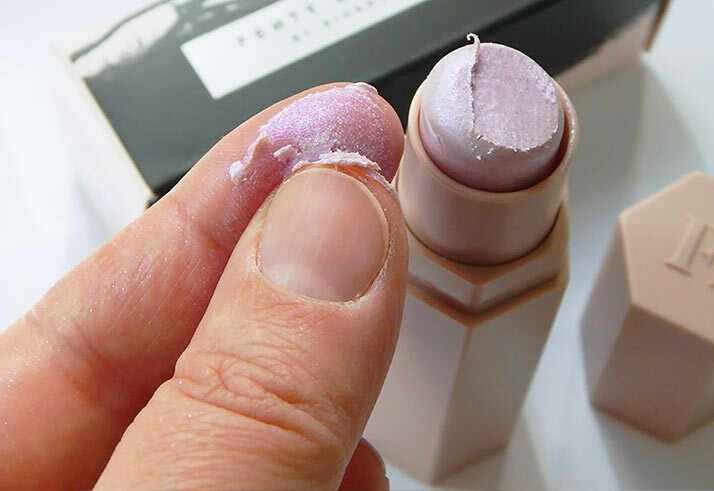 The one in this Fenty Beauty review is the Match Stix “Shimmer Skinstick”, which is the highlighter/blush. The other Match Stix, referred to as a “Matte Skinstick”, comes in 20 skin tone hues and is for concealing, color correction, and contouring. DISCLAIMER: This product was purchased by the blogger. Neetzy.com received NO compensation from Fenty Beauty for this review. This review does not represent medical or professional advice, it is an opinion only. Photographs may not depict the exact color of the product. This Match Stix sells for $24 USD or $31 CAD at Sephora. 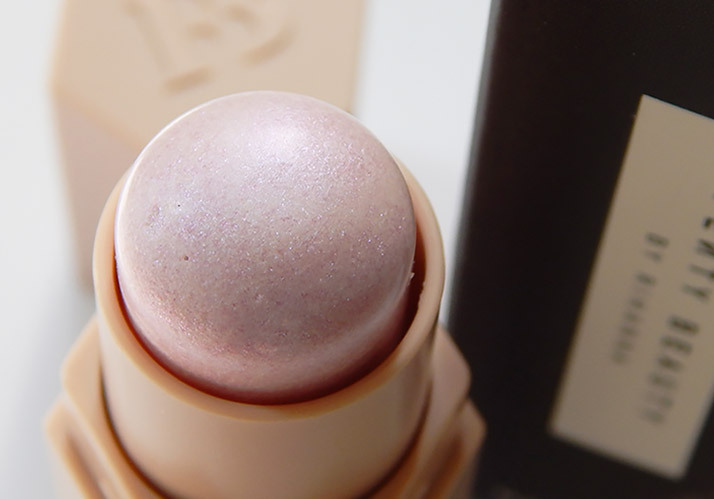 This product feels like a strong wax in the stick (no need to worry about breaking it during application), but when applied becomes a soft, dry, weightless shimmer. Although there is a specific brush for this product, it really isn’t necessary unless you want to splurge (the brush costs $24 US or $29 CAD at Sephora). This product easily glides across the skin with the warmth of your fingertips. From experimenting with this Match Stix, I suggest creating a crescent moon-shape around your cheek and temple using the width of the product. For Confetti, which is a very forgiving shade, I applied 3-4 layers and then blended it with my fingertips. You don’t need to use too much pressure to move this glimmer around – basically, just barely touch your fingertips to the surface of your skin and create soft, circular motions in the directions you want to move the product. You can even tap a bit of pressed powder over this product if you want to tone it down slightly. 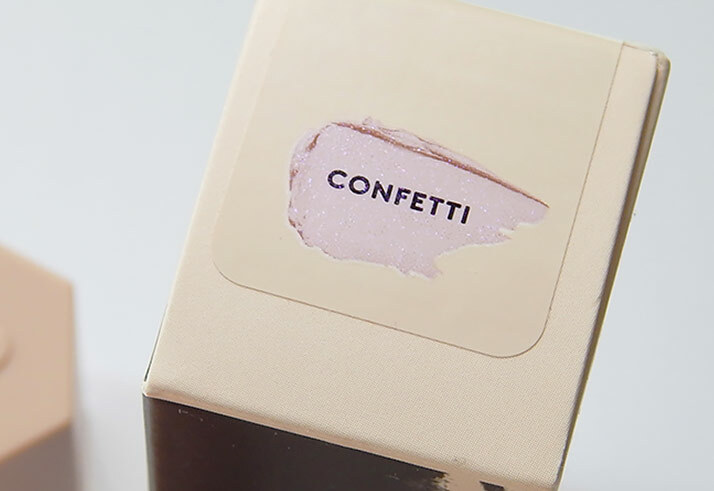 The color I tested for this Fenty Beauty review is called Confetti, a transparent shade made up of iridescent sheen. If you are using any of the other colors, I would suggest starting with less than you think you’ll need, and working up to the color you want. I played around with some of the more pigmented colors while at Sephora, and found that a little went a long way if you want to create a natural look. You can achieve a very natural look even with a glittery hue like Confetti, though I will mention that you will see much more sheen depending on the lighting you are in. At the time of this review, the Match Stix was available in 10 colors. Below are swatches of several of these colors. I honestly can’t think of anything bad to say about this product. The formulation is spot-on, it’s easy to use, and the packaging is practical. 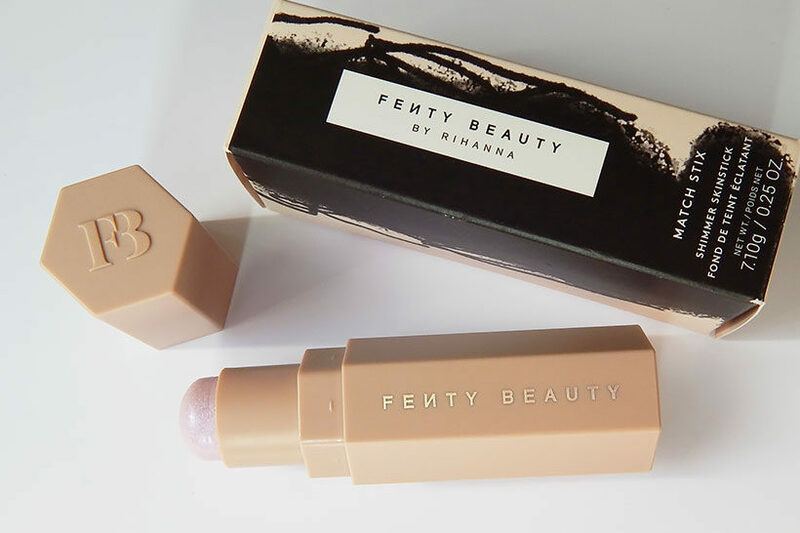 Regardless of whether you know much about Rhianna – truthfully, I hardly know who she is – there is likely something for everyone in this extensive collection of Fenty Beauty make-up. 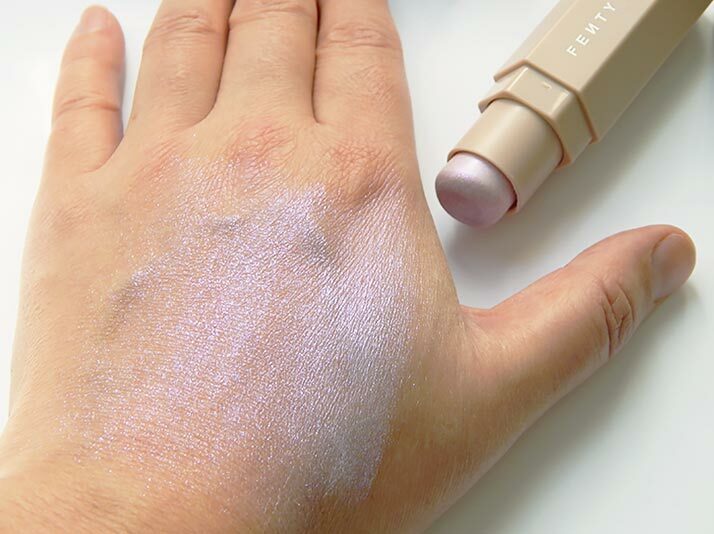 While this Fenty Beauty review covers the Match Stix highlighter product, I’m in awe of how pretty and wearable the colors are in this collection. This Rhianna make-up is something I’d recommend checking out. I’ve been getting a lot of use from this product and have worn it quite often. It’s a product I’m really in love with. It’s controllable so that you can achieve a natural look, yet it’s a little burst of fun iridescence. 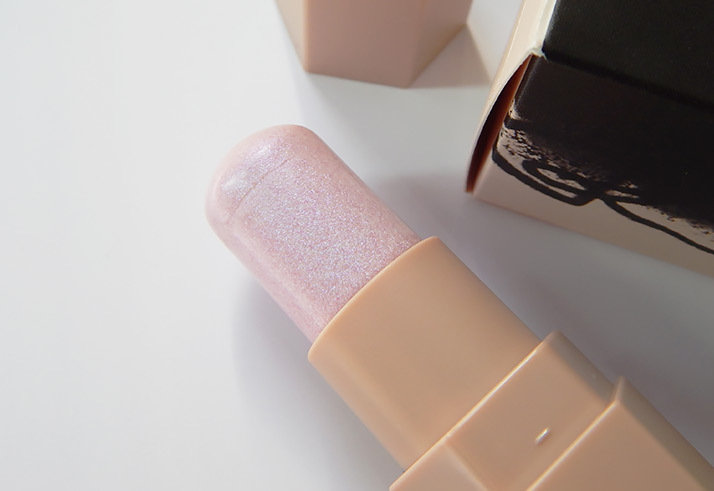 Also, if you are into the unicorn craze, I’d recommend this Match Stix in Confetti – though there is a hue that is more mauve that is actually called Unicorn. Perhaps what I love most about this Match Stix is that you can use it for other areas of your face as well – mix a bit into lip gloss to give your lips a bit of iridescence or use it to brighten under your eyebrows. The product easily washes off as well. The Match Stix (Shimmer Skinstick), currently available in 10 shades, is available at both Sephora and at FentyBeauty.com. If you’d like to try both a Match Stix “Shimmer Skinstick” as well as the skin toned “Matte Skinstick” for concealing, contouring, and correcting, the Fenty Beauty collection offers a set of 3 Match Stix for a great price – it’s almost like buying 2 and getting the third for free. At Sephora in the US, the price for this Match Stix Trio is $54, and in Canada the price is $67. The sets include full-sized Match Stix, and there are three different sets to choose from. Unfortunately, the color Confetti isn’t available in the Match Stix Trio. Neetzy.com is NOT an affiliate of Sephora or Fenty Beauty. WHAT’S YOUR FAVORITE FENTY BEAUTY PRODUCT? Great review! While I don’t wear much makeup, like usually just mascara, I feel I may go in to the store and ck it out!